April 25, 2008 -- Tiffany Brooks is about to graduate with honors from San Francisco State University, the first graduate of the University's Guardian Scholars program. There were times when she thought she'd drop out. "I knew so little about what to expect from college that on my first day I stood in the hallway outside the classroom waiting for a bell," the criminal justice major said. "I didn't even realize that there were courses I was required to take to graduate." The product of six foster homes, there was little talk of planning for college even though Brooks earned excellent grades. Fortunately, she managed to avoid slipping through the cracks like so many other foster youth who lose their foster home and state support when they turn 18. "I always thought that when the time came, I'd just have to look for a job and find another place to live," Brooks said. "But I am grateful for two things." Her last foster mother, Doris Peelers Brown of Berkeley, encouraged Brooks to apply for college and stood by her during the stressful and complicated process. Second, SF State was taking its first steps towards creating a Guardian Scholars Program. "Tiffany actually helped to shape the SF State Guardian Scholars program," said Linda Chiu, a Guardian Scholar case manager. "She made valuable contributions to focus groups designed to tailor the program to SF State student needs." The Guardian Scholars Program provided Brooks with access to housing, food, work-study opportunities, scholarships and, more important, social and emotional support. "Most people don't realize what it is like to discover at 18 that you suddenly are supposed to know how to support yourself," Brooks said. "Even as a Guardian Scholar, holidays and summers can be very hard if you don't have a home and family to return to." Brooks said she was lucky that Peelers Brown allowed her to remain at her house. She is looking forward to Commencement and gave her guest tickets to Peelers Brown. "Without her it wouldn't have even occurred to me to apply to college," Brooks said. "It'll be one way of saying thanks." Brooks' post-graduation plans are to look for a master's program with a combined Judicial Degree in public policy. 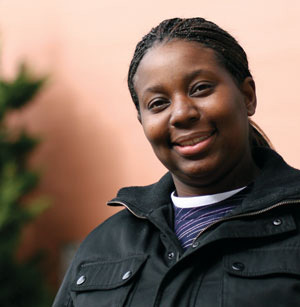 She plans to use her education to advocate for better juvenile and foster care in California. "I know that I will have to fight to have their voices heard," Brooks said. In the meantime, Brooks is sending her resume to law firms and hoping to trade her clerical position in retail for one in a law office. Now renting an apartment with other students, Brooks is mentoring a 15-year-old foster brother, Omar, whom she has known for six years. "He's like my protege," Brooks said. "I want to keep him from making the choices that so many boys his age do." This year there are 28 Guardian Scholars enrolled at SF State and 12 more will arrive on campus next fall. To make a donation that ensures more students like Brooks will receive opportunities to build successful lives, visit the Guardian Scholars program Web site or call (415) 405-0546.